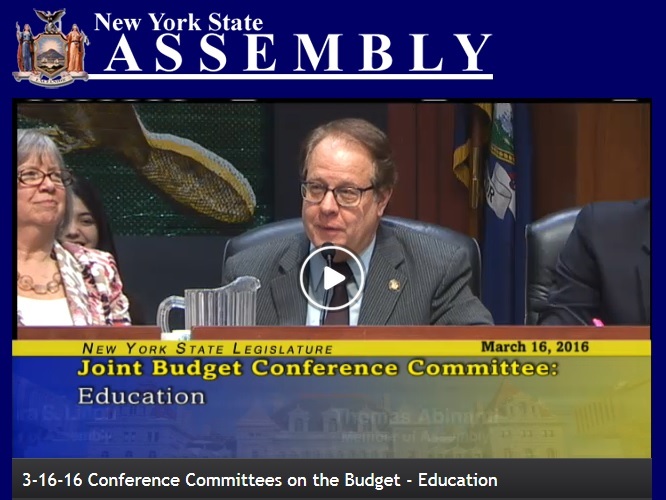 Assemblyman Abinanti, Chair of the Assembly Committee on Libraries & Education Technology, was appointed as one of the Assembly’s representatives to the Education General Budget Conference Committee where the Assembly and Senate negotiate their differences in education. rejects the Governor’s proposed $27.4 million in direct funding to charter schools. The Assembly invests an additional $1.7 billion in higher education, providing for a two-year tuition freeze for CUNY and SUNY students in addition to a 20% increase for opportunity programs. The Assembly proposal also increases the base operating aid for community colleges by $100 per full-time equivalent and raises the maximum TAP award by $100 to $5,265 per student. The Assembly provides $96.6 million in aid to public libraries – a 5.5% increase of $5 million over the Governor’s proposal and $24 million in the Public Library Construction Aid Program – a 70% increase of $10 million over the Governor’s proposal. The Assembly rejects the Governor’s proposed changes to early intervention which would have impeded access to services. The Assembly proposal commits $200 million to cover the costs of a minimum wage increase for direct care workers who provide services to people with special needs. In addition, the Assembly proposal invests $100 million over five years for additional housing opportunities for people with special needs. increases public disclosure for groups that lobby in New York.